""The Snake River Plain is a large arcuate structural trough that characterizes the topography of southern Idaho that can be divided into three sections: western, central, and eastern. The western Snake River Plain is a large tectonic graben or rift valley filled with several km of lacustrine (lake) sediments; the sediments are underlain by rhyolite and basalt, and overlain by basalt. The western plain began to form around 11-12 Ma with the eruption of rhyolite lavas and ignimbrites. The western plain is not parallel to North American Plate motion, and lies at a high angle to the central and eastern Snake River Plains. Its morphology is similar to other volcanic plateaus such as the Chilcotin Group in south-central British Columbia, Canada. The eastern Snake River plain traces the path of the North American plate over the Yellowstone hotspot, now centered in Yellowstone National Park. The eastern plain is a topographic depression that cuts across Basin and Range Mountain structures, more or less parallel to North American plate motion. It is underlain almost entirely by basalt erupted from large shield volcanoes. Beneath the basalts are rhyolite lavas and ignimbrites that erupted as the lithosphere passed over the hotspot. The central Snake River plain is similar to the eastern plain, but differs by having thick sections of interbedded lacustrine (lake) and fluvial (stream) sediments. Island Park and Yellowstone Calderas formed as the result of enormous rhyolite ignimbrite eruptions, with single eruptions producing up to 2500 cubic km of ash. Island Park Caldera, measuring 18 miles (29 km) by 23 miles (37 km), may be the largest symmetrical caldera in the world. The caldera formed when a dome of magma built up and then drained away. The center of the dome collapsed, leaving a caldera. The rim is visible in this image as a distinct ring of green in the satellite image. Younger volcanoes that erupted after passing over the hotspot covered the plain with young basalt lava flows in places, including Craters of the Moon National Monument." (Wikipedia)" cannot be used as a page name in this wiki. 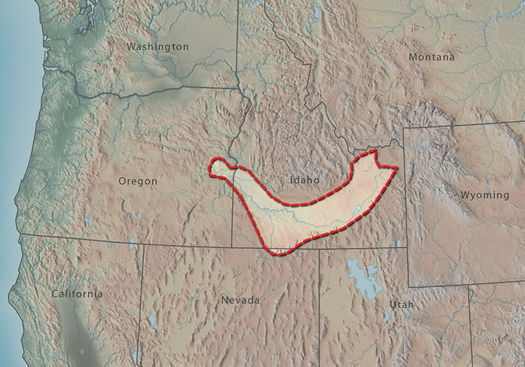 "The Snake River Plain is a large arcuate structural trough that characterizes the topography of southern Idaho that can be divided into three sections: western, central, and eastern. The western Snake River Plain is a large tectonic graben or rift valley filled with several km of lacustrine (lake) sediments; the sediments are underlain by rhyolite and basalt, and overlain by basalt. The western plain began to form around 11-12 Ma with the eruption of rhyolite lavas and ignimbrites. The western plain is not parallel to North American Plate motion, and lies at a high angle to the central and eastern Snake River Plains. Its morphology is similar to other volcanic plateaus such as the Chilcotin Group in south-central British Columbia, Canada. ↑ "USGS Assessment of Moderate- and High-Temperature Geothermal Resources of the United States"
This page was last modified on 11 January 2016, at 17:43.